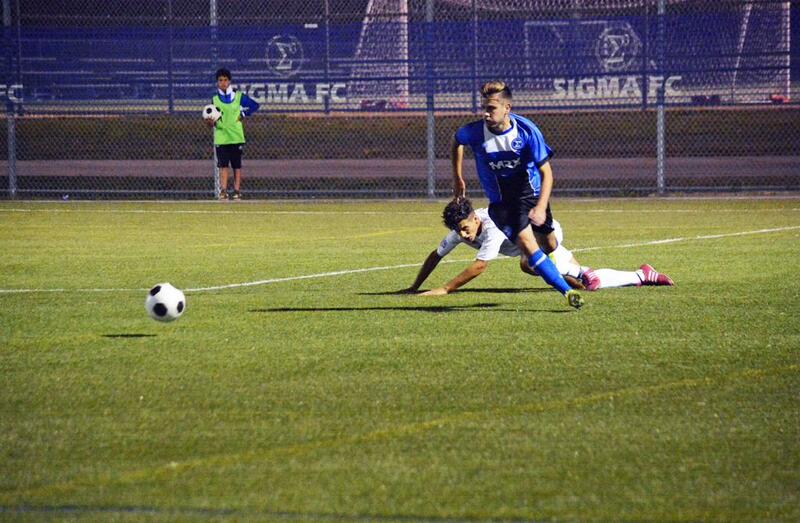 A dramatic finish saw Sigma FC come from behind to beat Woodbridge Strikers 2-1 in Group B action on Monday night. Hit hard by players heading off to college teams, it was a much younger Sigma team, with only three of the starting lineup from their previous game also starting this game. They played a recognizable Sigma game, passing patiently, building through the middle and then out to the wings, but the inexperience showed as they were unable to break through the Woodbridge defence, rarely looking threatening in the first half. Their best chance saw Emery Welshman cut in from the right wing and get a shot off that Woodbridge goalie Michael Scavone blocked easily enough. 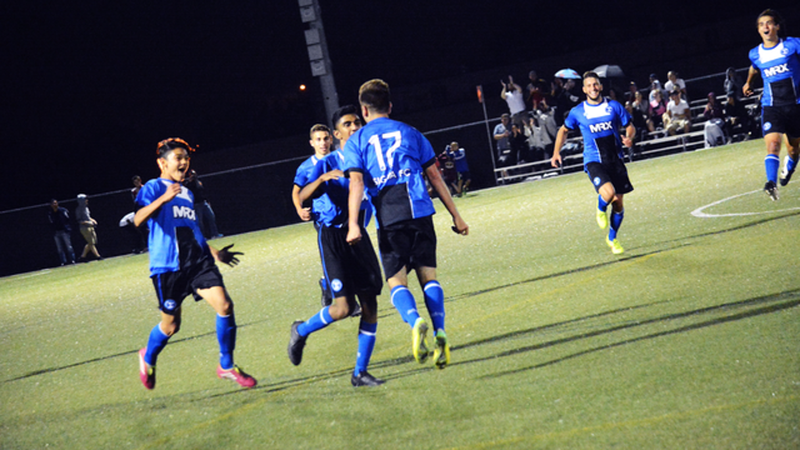 As for Woodbridge, their attack was generally more direct, most of their chances coming from quick breaks with strikers Viktor Anastasov and Mario Kovacevic running at the central defenders and trying speculative long shots, often coming close but rarely testing David Igreja in goal. They controlled the game more in midfield and kept possession better as the game progressed, but the first half ended in a bit of a stalemate, both teams trying to pass their way through the defences and neither looking all that likely to break through. The second half followed a similar pattern, Sigma starting off brightly without really threatening and Woodbridge eventually coming into the game. The breakthrough came in the sixty-first minute as a ball was played forward to Viktor Anastasov, on the edge of the box, who turned past his marker and hit a shot into the far corner to give the Strikers the lead. 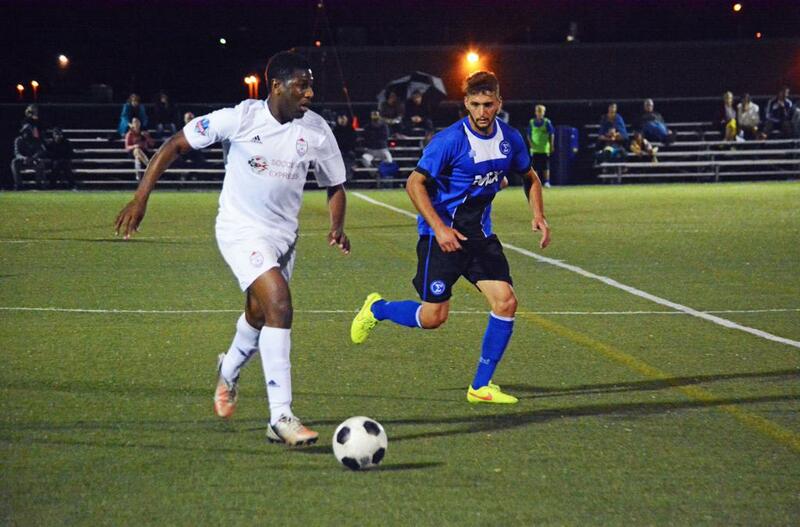 From there it was about Woodbridge’s defence, led ably by Franco Lo Presti and Jesse Andoh, and organized vocally by goalkeeper Scavone, keeping out the increasing pressure Sigma applied. It seemed comfortable enough with few scares, though Emery Welshman had a decent chance that he shot over the bar and Andoh blocked two shots within ten seconds as Sigma pressed. The weather was a very apt metaphor for this game, especially the play of Sigma as beforehand there was the feeling that a storm could happen at any moment, yet for most of the game it was remarkably calm. Midway through the second half though, the wind picked up ominously and storm clouds gathered. Simultaneously the pressure increased as time ran down, with a few hard tackles coming from both sides as desperation set in, and Scavone having to dive to punch away a dangerous Sigma cross. As the ninety minutes wound down and four minutes of added time were announced, that rain did come along with the strong wind and that’s also when Sigma finally broke through. Second half sub Jordan Pereira turned out to be the difference maker, it was his pass that set Welshman free down the left wing. He cut inside and beat the full back before hitting a low shot that crept in at the near post to tie the game at 1-1. Sigma kept coming, narrowly missing out on a goal from a free kick before getting one last chance form a long throw in. Scavone again came to punch the ball clear but didn’t get enough on it and the ball fell to Pereira about twenty-fice yards out. He volleyed the clearance over the crowd in the box, but there was a defender on the line who jumped to try and head the shot away. Instead, the ball hit the bar, bounced back onto that defender and into the net. A cruel way to concede a goal and a cruel way to lose the game for a Woodbridge team that deserved a point on the night. The defeat means Woodbridge remain on six points from four games at the top of group B though they now look very vulnerable as Sigma join Vaughan right behind them on four points from two games.